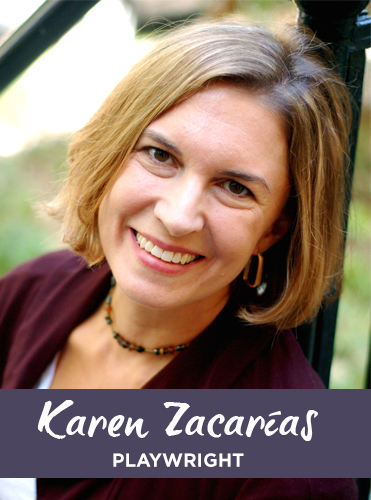 Karen Zacarías award-winning plays include the sold-out/extended comedy THE BOOK CLUB PLAY, the sold-out world premiere drama JUST LIKE US (adapted from the book by Helen Thorpe) at Denver Theater Center, the Steinberg –citation award play LEGACY OF LIGHT , the Francesca Primus Award winning play MARIELA IN THE DESERT, the Helen Hayes Award winning play THE SINS OF SOR JUANA , the adaptation of Julia Alvarez’s HOW THE GARCIA GIRLS LOST THEIR ACCENTS. Karen also has a piece in the Arena Stage premiere of OUR WAR. Her TYA musicals with composer Debbie Wicks la Puma include JANE OF THE JUNGLE, EINSTEIN IS A DUMMY, LOOKING FOR ROBERTO CLEMENTE, CINDERELLA EATS RICE AND BEANS, FERDINAND THE BULL, and FRIDA LIBRE. Her musical CHASING GEORGE WASHINGTON premiered at The Kennedy Center for Performing Arts and went on a National Tour. Her script was then adapted into a book by Scholastic with a foreword by First Lady Michelle Obama. Karen is currently working on the adaptation of Edith Wharton’s THE AGE OF INNOCENCE, a drama for Oregon Shakespeare Festival, and a Brazilian themed Oliver Twist musical: OLIVERIO: A BRAZILIAN TWIST ON DICKENS for the Kennedy Center. Her libretto of THE SUN ALSO RISES for the Washington Ballet received accolades in the New York Times and she is currently writing the libretto for THE LEGEND OF SLEEPY HOLLOW with Washington Ballet artistic Director Septime Webre. She is proud to be currently commissioned to write new plays for Arena Stage, Cincinnati Playhouse, Ford’s Theater, Adventure Theater, and First Stage. Her plays have been produced at The John F. Kennedy Center for Performing Arts, Arena Stage, The Goodman Theater, Round House Theater, The Denver Center, Alliance Theater, Imagination Stage, GALA Hispanic Theater, Berkshire Theater Festival, South Coast Rep, La Jolla Playhouse, Cleveland Playhouse, San Jose Repertory Theater, GEVA Theater, Horizon’s Theater, People’s Light and Theater, Walnut Street Theater, Arden Theater, Milagro Theater, Teatro Vista, Aurora Theater, and many more. Her awards include: New Voices Award, 2010 Steinberg Citation-Best New Play, Paul Aneillo Award, National Francesca Primus Prize, New Voices Award, National Latino Play Award, Finalist Susan Blackburn, Helen Hayes for Outstanding New Play. Karen is represented by the Graham Agency and published by Dramatic Publishing. Karen is fluent in English and Spanish and highly proficient in Danish and French. She has BA with distinction from Stanford University and a Masters in Creative Writing from Boston University. Born in Mexico, Karen now lives in Washington D.C. with her husband and three children. Playwright Karen Zacarías finds inspiration in Arena Stage’s residency program. By teaching students to express themselves through the art of playwriting, YPT develops students’ language skills, and empowers them with the creativity, confidence and critical thinking skills they need to succeed in school and beyond.